Ever since Allison Feldhusen bought her Audi S4 Avant new on July 20, 2001, I’ve called it the TARDIS. Like the Doctor’s time machine, it’s a big blue box that flies through time and space, and it seems bigger on the inside than on the outside. The car has changed a bit since I first drove it, way back when, with less than 100 miles on it. Audis don’t have a great reputation for reliability and can be expensive to repair, but this car breaks that stereotype. Fifteen years and over 208,000 miles later it’s had a few improvements and seen its share of trials and tribulations, but it’s going strong and is more fun to drive than ever. Though considered not as cool as the BMW M3 back in the day, the B5 chassis Audi S4 is quite sought after by enthusiasts today. This particular car is a bit of a unicorn. 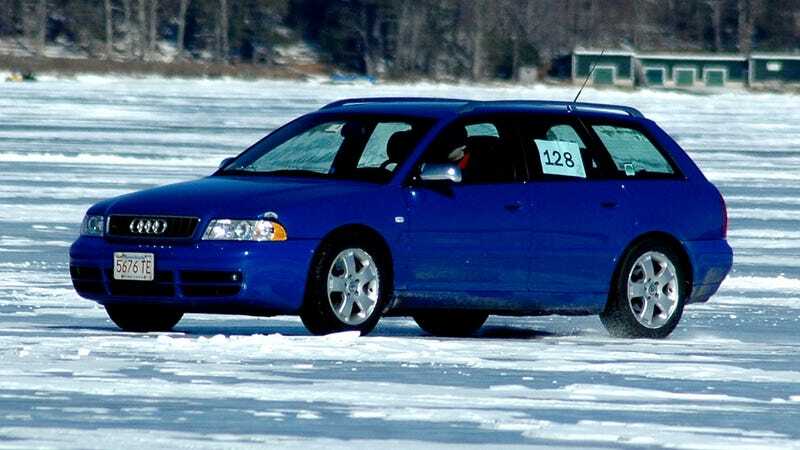 Not only is it a wagon Avant, it is the highly desirable Nogaro Blue, has a six-speed manual transmission, and is equipped with the sport package. Allison was very specific about what she wanted, and she got it, despite one dealer telling her this configuration was not available in the US. This car has not the much maligned V8, but a twin turbo V6 that produces 250hp. With a Miata sharing the garage for autocross and track shenanigans, the S4 has served as Allison’s daily driver. It has seen several excursions onto the frozen surface of Newfound Lake, NH, for the Boston Chapter BMW CCA’s IceCross series. These are essentially autocrosses on frozen lakes, and significantly lower risk than wheel-to-wheel events. That’s not to say they are without risk, though. Both the S4 and my BRZ wear minor battle damage from snowbanks that changed to solid ice. Quattro power certainly helped, as did Hakkapeliitta snow tires. Traction control is a simple on/off switch labeled ESP, indicating that the car thought it could read your mind and was smarter than you. The car does well on course with a co-driver to turn off ESP to allow wheelspin and better straight line acceleration, then turn on ESP and cause the hand of God to reach down and keep the car on course after entering a turn too quickly. We were pretty successful once we figured out this technique together. But the S4 just isn’t cut out to be a race car. It’s too big and heavy to run with the WRX and Evo, even the less powerful versions of its time. That’s OK, because the S4 excels as a fun, sporty, practical daily driver. Allison has personally driven it most of the way to the moon, with over 208,000 miles on it today. It’s suffered some bumps and bruises over the years. The chrome mirrors were stolen out of her driveway on one occasion. Someone else tried to steal her HID headlights but succeeded only in denting the fenders. Fortunately, being aluminum, they never rusted. Both bumpers have been replaced once or twice. Considering that this car has commuted into and around the Boston area its whole life, it’s actually in very good shape for its age and mileage. The Nogaro Blue Curse seems to have bypassed this car. The interior has also held up amazingly well. Part of that comes through having been well maintained its whole life by a caring owner. I’ve had a few factory leather steering wheels deteriorate so badly over the life of a car that I had to put covers on them just to keep my hands from feeling nasty after driving the car. But this S4's leather steering wheel is in great shape. It has a few small scratches, but that’s completely forgivable after 15 years and 208k miles. Unstereotypically for a VW product, with the exception of the LED message center in the middle of the instrument panel, everything still works. There are no cracks in the dashboard, unlike other older German cars. Even the combination CD player and tape deck (remember those? No? Ask your parents) work great. How does it drive? Again, surprisingly well for its age. Of course, it’s had some help. The original suspension wore out, and replacing it are Neuspeed springs and Bilstein struts. All of the mounting hardware was replaced as well. This lowers the car quite a bit, virtually eliminating body roll. Handling is significantly improved, and even on snow tires I could feel it through a local twisty road I drove in a highly spirited manner. Yet driving the terrible roads through the center of Fitchburg, MA was not punishing, either. Though not entirely smooth, it soaked up all but the worst bumps, and rode better than my BRZ. But the low ride height creates a problem when driving Boston roads with raised manhole covers. This Audi is almost as low as her Miata, and both cars need to slalom their way around raised obstacles. Allison added an aluminum skidplate to the S4 to prevent damage to low hanging engine parts, which aren’t cheap to replace. Power has not been altered from the stock 250hp. When I first drove the car back in 2001, it felt like a rocket ship to me. But at the time, I was used to the 116hp Miata and 124hp Saturn I owned at the time. By today’s standards it’s an underwhelming amount of power. My wife’s Ford Flex has more than 100 more and would easily beat it in a drag race. But in 2001 this was the hottest Audi available in the US. I certainly would have enjoyed more power at times, since I’ve been spoiled by today’s more powerful cars, but at no point did I feel that the S4 didn’t have enough power for my needs. It’s also quite usable. Unlike the Ford there is some turbo lag, but not much. Boost comes on early and significantly improves torque at lower RPMs, which is useful in city driving. It gets up to highway speed quite easily with no drama at all. A huge aftermarket exists that can boost power pretty much as high as you want. The stock shifter has much longer throws than I’m used to, but they’re crisp and clean. If it was my car I’d install a short shifter pronto, but Allison likes the stock shifter, and it works perfectly well. What this car does best is comfortable sporty street driving. It’s not out to win races, but it’s a great step up in both luxury and performance from the A4. And despite its loud color, it’s a particularly stealthy vehicle. Nobody expects a woman driving an Audi wagon to be fast until all you can see are her taillights. Cars like this, and Justin Abide’s Civic wagon, make me sad that wagons have gone out of style in favor of crossovers and SUVs. You can get all the performance a car can give you in a highly practical package, without jacking it up to look tough and tower over traffic at the expense of handling. If I didn’t already have a dead Jeep Comanche wasn’t trying to buy house right now, I’d be interested in buying this car myself.